In my last post, I mentioned that we have a new addition to our household and I’d like you to meet him. His name is Clyde. Clyde has been with us for about seven weeks now. 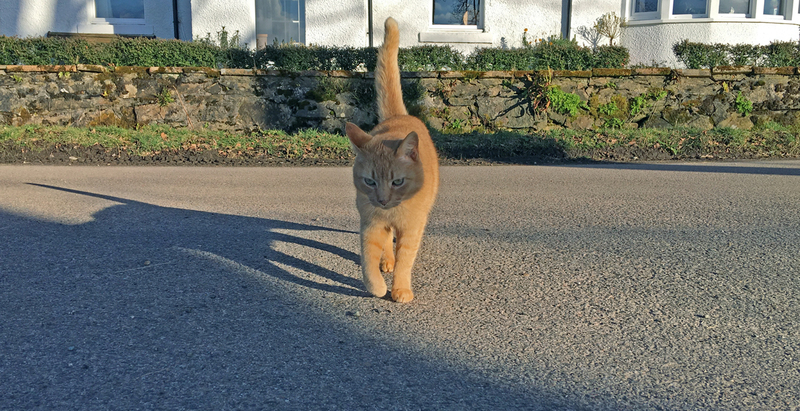 He used to live across the road from our old house, and was an occasional visitor – you may have seen him in some of my posts about Purdey. His humans were wishing to spend more time abroad and so I offered to adopt him. As you can see, he is thoroughly lion-coloured, with long legs and pale green eyes. He’s about 14 years old. It took Clyde less than 24 hours under a new roof to decide that he wanted to be let out, and he asked politely but firmly. So for many evenings after his arrival I was standing outside, wrapped in about 12 layers of clothing, while he trotted around cheerfully investigating his new surroundings in a wide and determined sweep which included the neighbouring gardens, the woodlands at the back, the slope down to the shore, and the nearby riding stables, which he found very interesting indeed. He’s a gentle old soul with a deep gravelly purr. He loves to be cuddled, and fully expects to sit on my knee for half an hour every morning before dropping off to sleep. Sitting on knees is not Purdey’s style at all – she thinks it’s quite ridiculous. She treats him with varying degrees of disdain, along with the occasional sideswipe to which he responds calmly and ph ilosophically. To give her credit, Purdey is sharing her space very well, considering she’s had our home to herself for eight years. For that reason, it seems quite fitting that the winner of Purdey’s PAWS Awards 2018 is actually…. Purdey herself! Since she’s currently outside interviewing the local voles – one of whom says he had a minor role in Local Hero – I’m going to do the presentation myself. This probably isn’t within my remit and I’ll be sacked as her agent tomorrow morning, but I know where the chicken Dreamies are so I’m not too worried. So, let’s do it properly. The winner of the Golden Fir Cone this year is…..
I’ve got to say this was a role in which Purdey truly excelled herself. Despite being virtually blindfolded, she could repeatedly and unerringly pinpoint my bare feet and sink her fangs into them before I could take evasive action. Thank you to everyone who voted for her. She’ll probably see it as encouragement, but I’ve got some slippers now and she doesn’t find it quite so rewarding. Her commiserations (well, vicarious sympathy) go to Ponyo and Angel, who presented some of their best work this year. I really thought that Ponyo was a clear winner with Fatal Attraction. I’m glad I’m not the one who has to break the news to her. Sorry, Pon! You’re still the fluffiest cat I’ve ever seen. And I loved Angel’s work in Far from the Madding Crowd, my personal favourite. Next year we’ll have another contender, and I can’t wait to see what kind of creative offerings Clyde will come up with. I can see him in a classic Poirot role, a suave and immaculate detective who sees everything but says nothing. He’s out doing some detective work as I write this – bat detecting, probably. Thank you to everyone who voted! Your admiration and greetings were very gratefully received by the pampered starlets and served to enhance their already enormous self-esteem. See you again next year! Your cats are beautiful! They are lucky to have so much outside space to wander around in. I have four cats and they all have their unique personalities. Thank you, Linda! They are very lucky, that’s true. Yes, every cat is so uniquely different! You have to live with them for quite a while to get to know them properly. Having four must keep you on your toes! Congratulations Purdey! Didn’t see how you could possibly lose this one. 🙂 Welcome Clyde! Maybe Purdey could use a leading man? Next years contest should be very interesting. Clyde seems to be settling in well, though he was already familiar with the surroundings. He is good lookin’. Lovely, funny, sweet–great story and great pictures. Thank you for your always interesting and heartwarming posts. Thank you, Deb! And you’re most welcome. Clyde is stealing our hearts like Purdey did when we first got her. Good to see them getting on with each other and this is a fabulous place for them to explore. Clyde is a very photogenic cat. I look forward to seeing more of him. Till then, Congratulations to Purdey for Ambush! Well done! They make a nice contrast to each other, Purdey and Clyde, and well done to Purdey on her PAWS award. Thank you, Lorna! They are both loving it here. So much to explore – like an adventure playground! Thank you, Nora, from both kitty cats! They are very much enjoying the outdoors here, especially now that spring is finally arriving. Thanks for your comment, and greetings back to you all the way from Scotland!